A team of University of California, Berkeley, astronomers say that its robotic telescope has captured one of the earliest images ever of the visible afterglow of a gamma-ray burst. The telescope started its exposures 108 seconds after the burst was detected by the HETE-2 satellite and continued for more than 2.5 hours, until brightening of the dawn sky halted the observations. The unprecedented record of the fading glow, captured Dec. 11, will help theorists as they puzzle out the physics of these bizarre cataclysmic events, which are heralded by a brief burst of energetic gamma rays and X-rays emitted billions of years ago and followed by a fading optical light. The UC Berkeley project using the robotic telescope to search for burst afterglows has operated for about a year, led by assistant research astronomer Weidong Li and joined by professor of astronomy Alex Filippenko, graduate student Ryan Chornock, and Miller Research Fellow Saurabh Jha. The telescope had previously observed the optical afterglow of another gamma-ray burst, but not as successfully as this one. "For the first time, we have really good data showing the early-time afterglow from a gamma-ray burst and the transition to late-time decline," said Filippenko, head of the Katzman Automatic Imaging Telescope (KAIT) at UC's Lick Observatory in California. The early-time fading was measured from the KAIT data by Chornock and promptly reported to the astronomical community. "These data will provide important constraints for astronomers coming up with physical models of gamma-ray bursts," added Jha, who will present the results on Jan. 9 at the Seattle meeting of the American Astronomical Society. The results will soon be submitted for publication in The Astrophysical Journal. The gamma-ray burst, lasting only 2.5 seconds, was recorded at 3:18 a.m. PST by the High Energy Transient Explorer (HETE-2), a small scientific satellite designed to detect and localize gamma-ray bursts. An e-mail alert went out 34 seconds after detection; 17 seconds later, KAIT began to slew across much of the sky toward the burst in the constellation Canis Major. Caught at the tail end of a 10-minute exposure of an unrelated dying supernova (exploding star), KAIT got 48 seconds of the burst afterglow (starting 108 seconds after the burst) superimposed on the longer supernova exposure, and then began taking short exposures as the glow faded. KAIT automatically captured 18 separate exposures in the first 10 minutes after pointing to the position of the gamma-ray burst. "No sane person would do it this way," said Filippenko, referring to the superposed unrelated exposures, "but a robot did, and that was the best thing it could have done." KAIT, a 76-centimeter reflecting telescope, is one of the largest high-resolution robotic telescopes in the world. Since 1997, it has been searching for supernovas and monitoring other celestial objects. Last year, Li programmed KAIT to interrupt its supernova search in the event of a promising gamma-ray burst. Gamma-ray bursts and their afterglows are very short-lived events, justifying interruption of the nightly supernova search. "Once KAIT gets the celestial coordinates from the Gamma-Ray Burst Coordinates Network (GCN), it checks to see if the burst can be observed, and if so, it can point to the burst location very quickly," Li said. "This is the kind of burst we have been waiting for." Though a burst pops off at random in the sky about once a day, most last such a short time - between a few milliseconds and a few hundred seconds - that they're hard to notice, let alone study in detail. First detected in 1967 by military satellites monitoring the nuclear test ban treaty, they remained a total mystery until five years ago, when the Italian/Dutch satellite Beppo-SAX first localized a gamma-ray burst sufficiently well to allow extensive follow-up at other wavelengths. Astronomers were able to determine from the spectrum of this burst's optical afterglow that they are very distant. Based on subsequent studies, most appear to have originated on the order of 10 billion years ago, when the universe was only a third its current age. By 1999, astronomers had observed numerous optical afterglows, but all were obtained an hour or more after the original gamma-ray burst. In January of that year, another robotic telescope captured an afterglow while a burst was still underway. 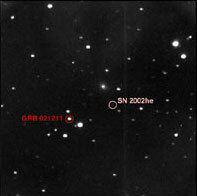 This was possible thanks to the internet-based GCN that alerts astronomers around the globe when a burst is observed by HETE-2 or, in the case of the 1999 burst, by the orbiting Compton Gamma-Ray Observatory. The 1999 burst remains the earliest optical detection of any gamma-ray burst. The Dec. 11, 2002, burst captured by KAIT was also seen by RAPTOR (RAPid Telescopes for Optical Response), operated by Los Alamos National Laboratory, about 65 seconds after the burst, making it the second earliest detection ever. RAPTOR, however, obtained only one exposure of the afterglow, so KAIT's continuing observations beginning 43 seconds later provide unparalleled coverage of the initial fading of the afterglow. The Super-LOTIS telescope at Kitt Peak in Arizona also captured some images automatically, starting 143 seconds after the burst. KAIT, RAPTOR and Super-LOTIS made observations while their operators were asleep. Not until 20 minutes after the burst did night-owl astronomers at the Palomar Observatory near San Diego first notice the optical afterglow. They were the first to announce the optical identification of the afterglow. The afterglow had faded beyond easy detection two hours after the initial gamma-ray burst, before anyone could get a spectrum and thus estimate the distance. 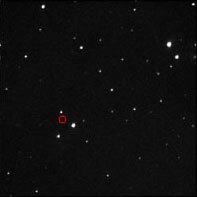 It probably was located 6 billion light years from Earth, the HETE-2 team estimates. "This afterglow faded incredibly fast, and may shed light on a whole lot of gamma-ray bursts that haven't had optical counterparts, the so-called 'dark' bursts," Filippenko said. "Maybe the optical light simply fades very quickly in many cases, thus explaining the apparent absence of optical counterparts." Another possibility is that the optical light from dark bursts has been obscured by gas and dust, making it hard to detect, but the Dec. 11 burst shows that rapid fading is the more likely explanation, at least in some cases, he said. Current theory holds that gamma-ray bursts are produced by an energetic jet of particles shot out during the collapse of the core of a massive star (perhaps 30 times the mass of the Sun) directly to a black hole, or during the merger of a neutron star and a black hole. The jet of high-speed particles creates a traffic jam a short distance from the explosion, perhaps one to 10 times the Earth-Sun distance (93 million miles). The particle jam rapidly heats and explodes in a relativistic fireball, which generates a shock wave traveling at speeds over 99.9 percent the speed of light. If the jet and resulting shock wave are aimed toward Earth, the gamma rays and X-rays emitted by the shock bunch up and pass the Earth in a brief burst. The fireball's shock wave traveling in the direction of Earth also produces visible light, as does the oppositely directed "reverse shock." The UC Berkeley observations with KAIT are the first to clearly show a fading curve from the forward shock superimposed on the fading curve of the reverse shock, which produces most of the very early-time optical light. "Ours is the best early-time observation of the optical afterglow, and the first to see the break point between the reverse shock and the forward shock," Chornock said. In cases where the gamma-ray burst results from the collapse of a massive star's core to a black hole, the outermost parts of the star could be ejected to form a supernova. Filippenko's team hopes soon to look for light from the supernova that might be associated with the Dec. 11 burst; it should appear later as the slower moving shock wave from the exploding star rams into the interstellar medium. Though expected to be much dimmer than the light from the initial burst, it might be visible with large telescopes such as those at the W. M. Keck Observatory in Hawaii, jointly operated by UC, Caltech and the National Aeronautics and Space Administration (NASA). Funding for KAIT came from the National Science Foundation (NSF), AutoScope Corporation, Photometrics Ltd., Sun Microsystems, Hewlett-Packard Co., Lick Observatory and UC Berkeley. Completion of the telescope was made possible by a generous donation from the Sylvia and Jim Katzman Foundation. KAIT research is funded by the NSF, NASA and the Katzman Foundation. NEW! The December 1968 journey of the Apollo 8 crew into lunar orbit is relived in this unique three-disc DVD set.